No one wants to have wrinkle marks around their eyes on their big V-Day date night! Luckily, this can be prevented with the help of ANNEMARIE BÖRLIND’s Eye Wrinkle Cream. This product is made with carrot extract and sesame oil which creates a gentle moisturizing glimmer. This vegetarian product can help make your eyes pop even more! Waking up in the morning and applying a refreshing face wash is the best way to start your day. Make sure to start off your Valentine’s Day the right way, and apply this strong antioxidant serum of carrot and Sicilian blood orange oils. This product also incorporates the perfect amount of vitamins B5, C, and E in order to feed your skin the nutrients it needs to thrive and glow. The search for the perfect product that minimizes the appearance of your pores is over! 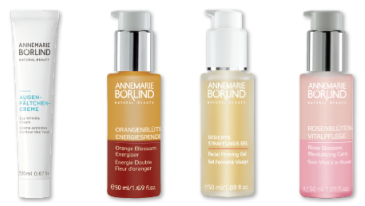 You can put on ANNEMARIE BÖRLIND’s Firming Gel when you’re in a rush to get ready for your Valentine’s Day date because it is fast-absorbing! This gel contains horsetail extracts which help to create a smooth complexion. Plus, this is a completely vegan creation! Get ready for your face to be radiant! This concentrated serum of Damask rose water and rose oil alleviates irritated skin. It’s a moisturizer, firmer, and revitalizer all in one amazing rose scented product. Who needs Valentine’s Day roses when you have this Rose Blossom Revitalizer?! Try out these products for your Valentine’s Day look this year!